A fast and easy alternative to the good old American classic. Tastes like the real thing! In a skillet, melt the butter and add the apples. Toss to coat. Add the sugar and cinnamon and toss well. Cook over medium high heat 6-7 minutes until the apples begin to soften, stirring occasionally. 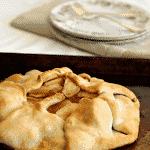 While the apples cook, grease a rimmed cookie sheet or line with parchment paper. Unroll pie crust in the center. Using a slotted spoon, transfer and pile the apples into the center of the crust, leaving a 3-inch border. Fold the edges of the crust up around the apples. Carefully pour about 1/4 cup of the cooking liquid from the apples into the center of the pie, over the apples. Bake 18-20 minutes until the crust is golden. Cool at least 10 minutes before serving. It's also really good at room temp or cold. Slice like a pizza to serve.